Neighbors fighting to block the construction of what could eventually become the city’s largest gas station will be legion when they finally take their case before the Visalia Planning Commission on Monday, April 9. The public hearing is scheduled for 7pm, and will be held at the Visalia Convention Center, 303 E. Acequia Avenue, to accommodate what could be a huge crowd of citizens. Those leading the fight to keep their neighborhood as quaint as possible are enlisting as many allies as they can. As the meeting date approaches, the group is also canvassing homes surrounding the corner of Caldwell Avenue and West Street where the gas station could be constructed in an effort to both educate residents and to get them in the seats next Monday night. Robin Hernandez–who leads the fight against the Chandi Group’s plan to bring a 20-hour-a-day ARCO AM/PM to her neighborhood–has called the fight “a David-and-Goliath story for sure.” The group she leads, Oppose ARCO, is looking to enlist some giants on its own side. 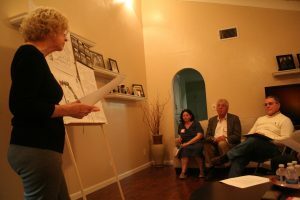 Already the group has played host to Mayor Warren Gubler, who is seeking election to the State Assembly in November, and more recently welcomed Councilman Bob Link to its weekly meeting. The group made sure the councilman understood they feel as if they’re fighting a war for their homes. “We’re seeing this as if an atom bomb is being dropped on us,” Hernandez told Link. Hernandez and the others fighting the coming of AM/PM say they were assured the land on the southeast corner of Caldwell and West would be used to provide services neighbors need, such as a grocery store and family-style restaurants. Chandi Group, in the extensive documentation provided to the city, claims the neighborhood needs the services it will provide: fuel, a drive-through restaurant, a convenience store and car wash. Oppose ARCO disagrees with that assessment. There is a much smaller gas station and convenience mart already on the corner, two car washes within a mile, and, much to the chagrin of those fighting further development, a Jack-in-the-Box restaurant a few hundred yards from the site of the proposed ARCO. It sits across the street from a large church and neighboring funeral parlor. The AM/PM, they say, is completely out of step with the nature of the 50 or so other small businesses that line that stretch of Caldwell. The Caldwell AM/PM will be smaller than a similar business currently being constructed in Visalia’s industrial park. The site on Caldwell is surrounded by homes on three sides. 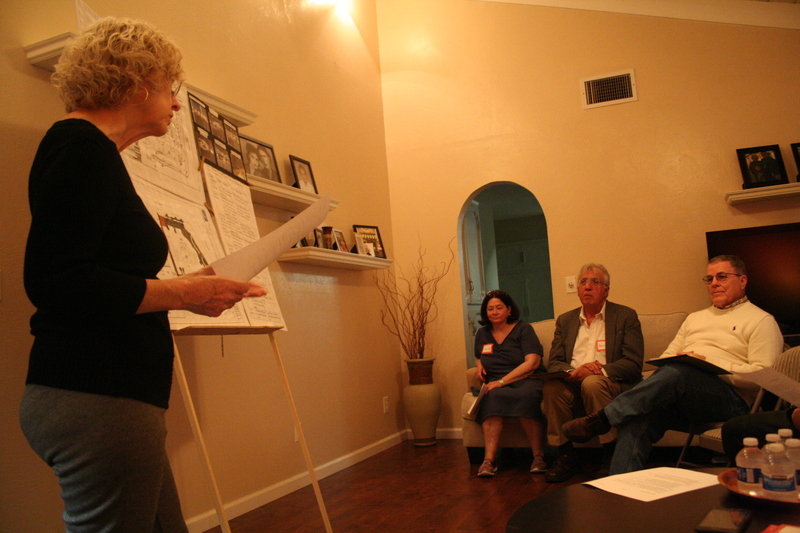 Noise, light pollution, more semi-trailer trucks and alcohol saturation of south Visalia are the obvious complaints stacked against the plan Chandi Group means to execute. There are more, however, and they are subtle. Not only will the fuel present the possibility contamination of the groundwater underneath property between two of the city’s natural creeks and next to the neighborhood drinking-water wells–and the less likely possibility of a massive explosion–it may also make it impossible for homeowners living within 300 feet to insure their mortgages with the FHA, the country’s largest mortgage backer. Additionally, Oppose ARCO says it has information Chandi Group plans to sell fuel to fleet vehicles at the site. They may also install showers to serve the numerous truck drivers who service the several large box stores near Caldwell’s intersection with Mooney Boulevard a mile or so to the west, opponents say. As the Oppose ARCO group learned how massive the high-density gas station complex was to be, a realization of the changes coming to their neighborhood overwhelmed them. “We went from being concerned to being horrified,” Hernandez told Link. In preparation for their plea to the Planning Commission to stop the AM/PM’s construction, the group has studied the more than 140 pages Chandi Group submitted for the city’s review. They say the documents are riddled with errors, inaccuracies and omissions. To demonstrate the true impact, they’ve consulted civic engineering firms and done their own lighting, sound and traffic studies. Dr. Bernard Cooker, another neighbor fighting the coming of ARCO, has been particularly outspoken in his criticism of Chandi Group’s work. Some members of Oppose ARCO feel staff at the Planning Department has been too cozy with the Chandi Group, giving them too much leeway so far regarding the accuracy of the planning documents. Councilman Link disagrees, however. The Planning Commission can reject it, and has already asked for improved documentation. When the commissioners consider neighbors’ objections to the project, they may require changes or place restrictions on what Chandi Group may do at the site. What the Planning Commission will do remains to be seen, Link told those fighting Chandi Group’s plan. “I don’t know what the Planning Commission will decide,” he said. Either side will have the chance to appeal the Planning Commission’s final decision, which may or may not come at the April 9 meeting. No matter what happens, Link thinks the matter won’t end there. “I think this will end up in front of the Council,” he said. To big for area, take it out to Hwy 99 were it belongs, it is to much traffic near Mooney and Caldwall now. do not need more slow trucks, smell and slow moving for more problems, need other stores there. Farmersville has 16 acres for sale along Hwy198. We’ll take it!